"Was it love at first sight?" The officiant, Dennis Prager, humorously asked Leslie and Andy to describe whether they felt this way the moment they met. The lovely Bride Leslie answered in 219 words. Andy, an ever stoic groom, answered in one. We wrote about it in 600 words, but we think you should just watch our video and see it for yourself. If you've watched several of our films, you'll notice that sometimes they open on a quiet note, and sometimes they open with a bubbly song, and other times they begin with a fast frenzy. 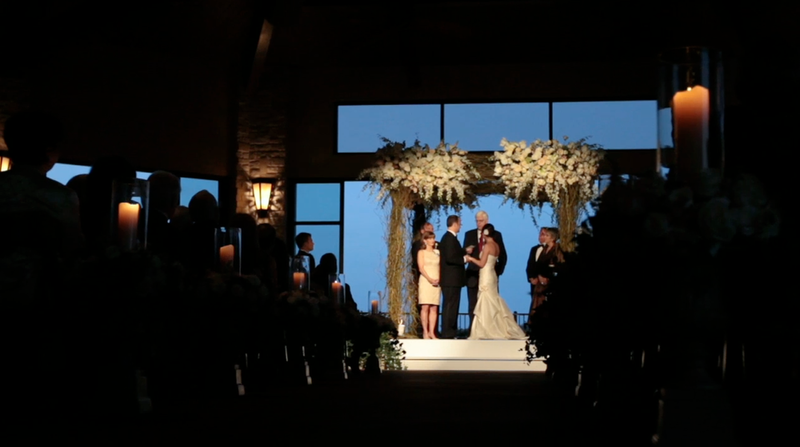 We try to make our films match the excitement, tone, and energy of the couple and of the day itself. It didn't take us long to see that Leslie and Andy love upbeat, big band style music, and they love having a good time with their families. The couple had traveled from Houston to Austin for their wedding at Barton Creek Resort, and their families joined them from all over the country. Before the wedding, Leslie had told us that quite a few of her family members would be some serious fun on the dance floor. (you can read more about that here) As you can see, they really were! We left the wedding with just as much energy as when the reception began--the dancing was just so fun. Barton Creek Resort is nestled in the Texas hill country outside of Austin, and the ballroom has a great view of the foothills. The resort is also famous as both a golf club and where Jessica Simpson and Nick Lachey were married. The building proudly boasts of its Texas locale by hanging revolutionary Texas artifacts throughout the hallways, historic photos, flags, and other items of Lone Star State Pride. Leslie's Bridesmaids wore a very formal royal blue dresses with champagne gold shoes of their choice. The colors were a preppy contrast with their tightly gathered and uniform rose bouquets. Sally Fields may have blown off Julia Roberts' colors of 'blush and bashful' as 'pink and pink' in Steel Magnolias, but one look at the pink hues in Leslie and Andy's luscious floral and reception design makes even the adjectives 'blush and bashful' seem incapable of describing the delicate rosy and romantic hues that surrounded the couple on their wedding day. Classic, elegant, and dripping with crystalline beauty, the wedding was a formal affair from the rose and curly-willow covered chuppah to the glass chandeliers in the reception. Doesn't this chuppah take your breath away? It has a very fairy-tale quality. David Kurio designed the decadent florals, and Jessica Moore was the event designer/planner. My favorite element is how David Kurio's team hid lights inside of the chuppah. Because the wedding happened at sunset, the challenge was to keep the bride and groom well lit throughout the ceremony, even after dark. The team had the perfect plan for the lights to continue to adjust throughout the solarium as the sun went down. The wedding began lit by the ceiling-to-floor windows, and by the end, the lovely spotlights inside of the chuppah and beaming from the ceiling kept the bride and groom's faces well lit enough that the guests, the photographers, and the videographers could still see their faces perfectly well. 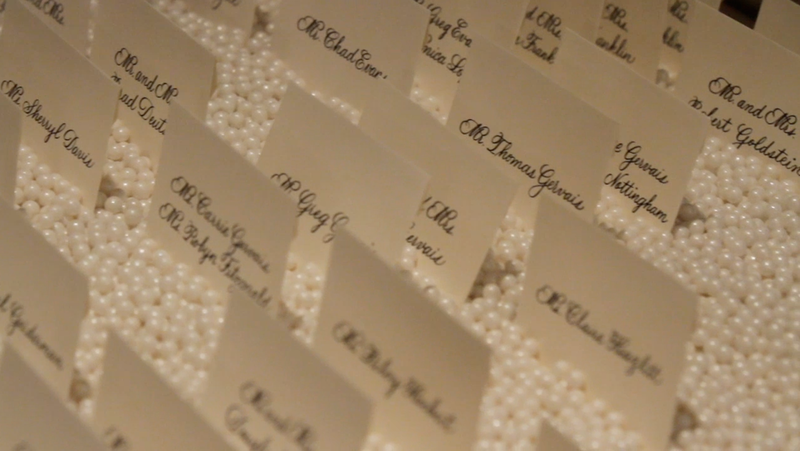 As guests gathered for cocktail hour, they found their place-tags organized in a table-wide bed of pearls. The round reception tables were covered with alternate and varying sprays in mirrored vases and glass chandeliers. The light reflections on mirror and refractions through cut glass sent light dazzling through the reception. Hats off to Jessica and David for the gorgeous display, and to Leslie and her mom for selecting such a lovely theme. 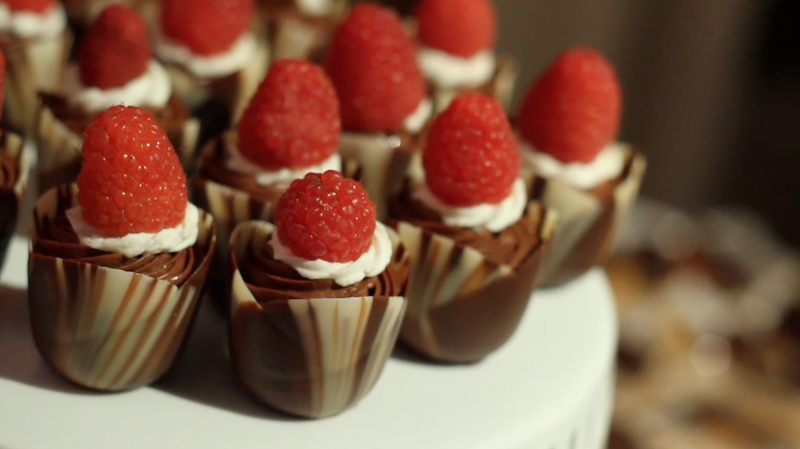 Jessica, the planner, worked diligently with Leslie to create the perfect dessert buffet that extended for several tables with all kinds of sweet delicacies in bite sizes--allowing guests to sample several lovely treats. Leslie and Andy, thanks for letting us document the goodness of your Austin wedding.